At least 12 people have been killed and four others critically injured in a fire at an apartment building in the Bronx borough of New York. New York City Mayor Bill de Blasio said the fire was the deadliest in the city for at least 25 years. The victims include a one-year-old child, he added. The cause of the fire, on Prospect Avenue, near Fordham University and the Bronx Zoo, is not yet clear. More than 160 firefighters helped bring the blaze under control. Officials said the first alarm sounded at the five-storey building at about 19:00 local time (00:00 GMT). The fire started on the first floor and quickly spread. Television footage showed firefighters carrying people to safety from fire escapes. Residents who managed to escape huddled outside in bitterly cold conditions. The Red Cross handed out blankets to those on the street, as some residents fled the building without shoes or coats. New York City is experiencing a severe cold snap, and as temperatures dropped to around -10C (13F) the water from the firefighters’ hoses could be seen turning to ice on the ground. Speaking at the scene, Mr De Blasio said a nearby school had been set up to shelter those evacuated from the building. “We’re here at the scene of an unspeakable tragedy,” Mr De Blasio said. He said the fire service had managed to rescue at least 12 people from the building. Fire Commissioner Daniel Nigro, standing alongside the mayor, described the fire as a “tragedy… without question historic in its magnitude”. “People died on various floors of the apartment [block], ranging in age from one to over 50,” he told reporters. Witness Rafael Gonzalez, who lives in a building across the street, told WCBS-TV he was woken by the smell of smoke and then saw some people using a fire escape of the burning building as the fire raged. Luz Hernandez told the New York Times that her fourth floor apartment had filled with thick smoke. She said she escaped through a fire escape with her husband and two sons as the smoke continued to rise around them. The building contains more than 20 flats and was built just over 100 years ago. The Associated Press said the fire was the deadliest in New York – excluding the 9/11 attacks – since 87 people died at a social club in the Bronx in 1990. 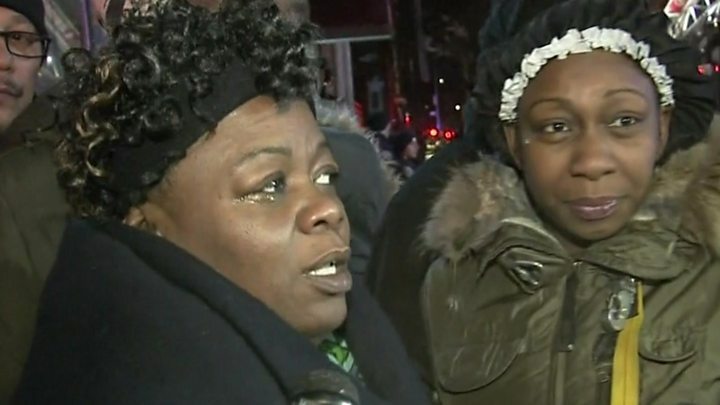 Earlier this month, a mother and her three children died in a fire at their home in Brooklyn, New York. Did you witness what happened? Do you live in the affected block? If it is safe for you to do so let us know about your experiences. Email haveyoursay@bbc.co.uk with your stories.